Chairman of Dubai Holding Abdulla Al Habbai expressed pride in the execution of this mega project in collaboration with Emaar Properties, adding that this project represents a quality addition to the company’s accomplishments that have contributed to the urban development of Dubai. He also said that the new project raises the bar for major urban projects in term of competitiveness, not only regionally but also globally, given the innovative and creative ideas implemented. 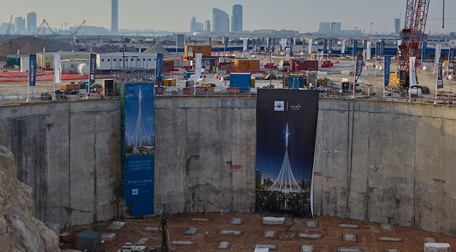 The Tower adds incredible economic value to Dubai Creek Harbour where Emaar has unveiled exceptional residential projects including Creek Gate, Harbour Gate, The Cove, Dubai Creek Residences, Creekside 18, Harbour Views, and Creek Horizon, among others.